Chris Carpenter–What Should the Cardinals Do? So, it is going to be a rough year for the Cardinals. Granted, as a Cubs fan, I cannot say that I am saddened by that fact, but I am saddened that arguably the best pitcher in baseball for the past two years is out for all of 2011. Added with a questionable decision to swap out Brandan Ryan for Ryan Theriot (seriously, why does Skip Schumaker get to stay?!) and the fan base’s concern over the state of Albert Pujols’ contract, there are sure to be some dreary days ahead. Now, we all know that Dave Duncan is a dark wizard from another dimension and can make a pumpkin like Kyle Lohse into something good (for a short stretch; just long enough to rob the STL front office), so we cannot just call the season a lost cause because of one starter, great though Wainwright is. However, if the expected is reality, and the 2011 season is a roller coaster doomed from the start in St. Louis, there is another pitcher that might have to face a tough future–Wainwright’s mentor, Chris Carpenter. After stellar outings in 2005 and 2006, Carpenter pretty much punted on 2007 and 2008 due to injuries. Then he had a career year in 2009, and one could argue that he had the Cy Young robbed from him. 2010 saw another solid year for the Cards’ co-ace, and the weight of the team’s pitching staff will be rested on his shoulders more so than ever. Again, we are calling 2011 a negative season for the Cardinals, so his jersey might change at some point. Carpenter’s not a cheap commodity; few talented pitchers are, and such a case is a 99% impossibility at his age in this era of inflated contracts. A poor outing as a whole by the Cardinals could lead them to deal Carpenter, and there are absolutely going to be suitors for a high-end pitcher, especially when the receiving team could pick up his $15 million option, meaning he could be more than a CC-Milwaukee rental. However, there is one issue: even if the Cardinals struggle this season, is trading Carpenter the best option for the team? That question is a tough one to answer. The biggest problem, of course, is the price tag. With the Pujols extension on the horizon (every Cardinals fan in the world hopes), keeping Carpenter on the payroll with a possible $9 million Wainwright option and the $17 million+ of Matt Holliday might not be feasible. Sure, the team is likely to increase payroll to levels that they have yet to see in St. Louis, but even that might not be able to withstand Holliday, Carpenter, Lohse, Wainwright, and Westbrook if Pujols gets his desired $28-30 million per season, a number that could eat upwards of 30% of the team’s payroll alone. Those financial restrictions will be lessened by young, cheap players like Rasmus and Garcia, and possibly Shelby Miller, when he arrives. Still, the mentioning of Shelby Miller is another points as to why the team could move him–the farm’s not too strong. Some nice pieces have been raised in STL, but there aren’t a whole lot of top, young players in the system nowadays. Trading Carpenter could change that. Imagine if the Yankees are in a heated battle with the Red Sox and Rays near the deadline. They have often been known for being willing to sacrifice the farm to win now, and that could play into the Cardinals’ hands. Maybe they could grab a package with Dellin Betances or Manny Banuelos? Or what if the Twins are short an arm and will add short-term payroll while offering a promising young player like Ben Revere? There are teams with deep minors that could come knocking, and it could be to the benefit of the Cards to move Carpenter and reload that minor league system as much as they can. The move isn’t without negatives, though. Prospects are prospects, and they aren’t guarantees. And at what point do you decide to trade Carpenter, in terms of record and time left to make a playoff push? If the team is 5 games back with a division leader coming up at home right after the deadline and they have Banuelos on the table, what do they do? Well, we’re not the front office, so that'[s not for us to decide. They also risk a 2012 with the same problem as 2011–losing an ace and having little pitching depth to fill a back-end hole, let alone a front-line starter one. If it came down to my call, I would say trading Carpenter is the best decision for the club going forward. The financial benefits could be too great to turn down. It would shed a good chunk of payroll, and the team needs that at the table to hand over to Pujols. Filling up a thin upper-tier minors would be nice as well, whether getting one top guy or 2-3 mid-level ones. Wainwright’s not likely to be at full strength again until the middle of 2012 regardless, so even holding Carpenter for 2012 might be a waste, then they might end up making the decision to trade him in 2012, when he’s more expensive, a year older, and unable to come with an option for the receiving team, clearly lowering his value. The Cardinals would be well-off to plan for this season with selling at the deadline in mind, as there is likely going to be a lot of trouble ahead, and they could have some decent trade chips in Carpenter, Franklin, Theriot, and more to use at their leisure to help down the road. Lord knows that with the money Pujols is going to be getting, cheap, cost-controlled talent is something that they are going to need. Recently, we have seen a few deals go down with the Cubs. Carlos Pena was brought in to fill the 1B void, as I had suggested from the get-go (hooray for occasionally correct predictions!). Rumors about a Chris Davis deal were out there, but it was not meant to be (I didn’t want to trade Chirinos for him right after getting Pena anyway). Carlos Zambrano was mentioned in trade speculations to the Yankees (PLEASE take him!). Mark Prior was–in the saddest news since his last injury–inked to a deal with the Yankees (I seriously let out a Darth Vader, “NOOOOOOOOOO,” when I saw that). Then there was the best news of all: Kerry Wood has returned to Chicago. Following a two-year hiatus in Cleveland and New York, Wood is back. His contract was a little bit quizzical, though. He only got $1.5 million with some incentives, which showed–like the Cliff Lee signing, but to a greater extent–that who he played for superseded what he played for (in terms of dollars, at least). Still, there have been some crazy contracts given to relievers in the last couple of offseasons (Brandon Lyon, anyone? ), so that he could only manage a base salary of $1.5 million from the Cubs almost seems exploitative on the part of the team. Regardless, seeing him take the mound for the Cubs again will be awesome. After a horrendous start to the 2010 season, Wood was (also sadly, seconded only by Mark Prior) sent to the Yankees. Despite that, Wood pitched like the man he was setting up–Mariano Rivera–by putting up a sparkling 0.69 ERA over26 innings, in which he allowed just one home run and struck out 31. That led to a horrifying spectacular 625 ERA+ (seriously, what?!). As a whole, the season was actually rather ho-hum, due to the fact that his Cleveland stint involved a 6.30 ERA. Over all of 2010, that ERA+ drops all the way to 133, and that 0.69 ERA inflates to 3.13, a tad higher than you would want to see from your setup man. And, of course, durability might be an issue. 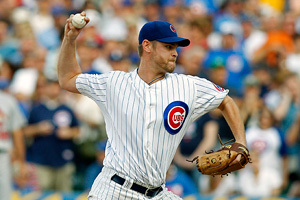 Since saving 34 games in 66 1/3 innings for the Cubs in 2008, Wood has seen his inning drop to 55 in 2009 and 46 in 2010. Hopefully that is not a trend, because seeing Wood gleefully return to Chicago only to see him have the same injuries that plagued the start of his career would be an awful knife in the heart of a fan base that already had to deal with the passing of Ron Santo less than a month ago (R.I.P, Ronnie). But I do not foresee that as the case. I am expecting a solid 50+ innings from Wood in 2011, which will probably involve 25-30 holds and a 2.85 ERA and a 10.5 K/9. Now I’m not one for predictions (I rarely make preseason WS picks, or even high-hoped divisional picks), but I feel pretty safe with that. The ERA might be on the low side, but as a setup man, rather than a closer, Wood will probably pitch to lefties less frequently, with Marshall picking up the lefty setup duties. So, welcome back, Kerry. And, just a suggestion, if your annual charity bowling event happens, do Santo a solid and donate the money to diabetes research this year. teams are: The San Diego Padres, the Florida Marlins, the New York Mets, the Pittsburgh Pirates, and the Cleveland Indians. This portion of the article will cover which teams would best serve the league by taking the fall. Since my last posting, I have added on as to what I will use to determine for a team’s contraction considerations. Baseball is, first and foremost, a business. Forbes produces an annual list of team values, offering up a team worth, along with a percentage change from the previous years. This will be key to see how a team’s worth is measured in terms of dollars and cents. As I stated before, though, a pure dollar value is not all that affects a team. All stats in parentheses are from 2010. RSN rating leader is St. Louis Cardinals at 9.70, and the lowest rank is shared by the Oakland Athletics and the Los Angeles Angels of Anaheim, at 1.23. Cleveland Indians (Record: 69-93; Attendance: 17,395; RSN Rating: 3.13): If I was to name this team with a song, it would be Green Day’s “Boulevard of Broken Dreams.” I mean, what happened here? Cleveland was rocking and on the way up with masher Travis Hafner, up and coming stud Grady Sizemore, and two strong starting pitchers named C.C. Sabathia and Cliff Lee, plus a decent young arm in Fausto Carmona. They also sported one of the league’s top catchersi n Victor Martinez. And since those days? Cleveland managed to have the lowest average attendance in the majors, and was tied for 28th in terms of attendance percentage (just 40.1). C.C. is now CC, and was shipped to Milwaukee for a flop in Matt LaPorta after a Cy Young season. Cliff Lee had a studly 22-3 season to win his own Cy Young, shortly before being shipped off to Philadelphia for four prospects that I’m pretty sure they don’t miss too greatly. Martinez was traded for Masterson (who is the master of inconsistency, if anything) and a solid, young arm in Nick Hagadone that we have yet to see in the majors. Hafner got hurt and looks like he is just done. His OPS+ has been solid, but he hasn’t broken 120 games played since 2007. Carmona’s 148 ERA+ in 2007 has been followed by a 2008-2010 stretch with a 72 ERA+. Sizemore looked like the superstar after a 2008 in which he hit .268 with 33 HR and stole 38 bases. Now he’s managed a combined 139 games in two seasons (just 33 in 2010). Still just 28, it’s way too early to write him off, but he might get too expensive too quickly and get jettisoned like Sabathia and Lee. Despite being above Kansas City in the standings in 2010, they lack the rich vein of prospects that the Royals have. Still, they have some quality minor league players; one I particularly like is Drew Pomeranz. Just getting healthy and getting the young guys up should help them, so I think Cleveland deserves a chance to see the full return of their fire sale–we saw how it worked for Florida. New York Mets (Record: 79-83; Attendance: 32,401RSN Rating: 3.25): Last semester, I did a PowerPoint presentation on how much a baseball team spends on wins. The highest cost per win average? 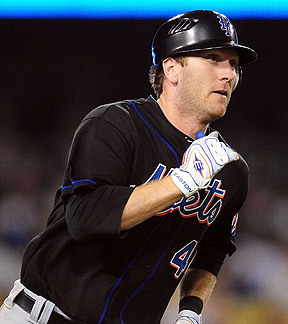 The New York Mets, at over $2 million per win. In 2010, they upped their won total from the 70 in 2009 to 79, so that cost is likely lower. However, I would still put my money on the Mets as the team with the highest cost per win, though the Yankees and Cubs might be higher. Florida Marlins (Record: 80-82; Attendance: 18,825;RSN Rating: 3.05): This one might seem a little odd. The Marlins have been consistently competitive, while keeping a very modest payroll. And with a new stadium on the way, scraping this club now seems like a very shaky and questionable move. A team settled with one of the best middle infield combos in the league in Hanley Ramirez and Dan Uggla, an overpowering ace in Josh Johnson, and a young stud in Mike Stanton probably shouldn’t be dismantled. However, there are some problems with this franchise. Twice now, it has gutted its roster after a championship. It took baseball’s explicit complaints to get them to give Josh Johnson a modest, team-friendly extension. This new ballpark is also another example of their cheapskate owners’ dirty tactics to rob the fans of money and on-field production. This has led to a team whose ticket sales rank 28th in the league and 22nd in percentage. The local TV ratings are 20th in the league, and the payroll sits 26th in the league. San Diego Padres (Record: 90-72; Attendance: 26,318;RSN Rating: 4.79): 2010 might have saved the Padres from the chopping block. The team was looking to move All-Stars Adrian Gonzalez and Heath Bell, but they managed to showcase a potential new ace in Mat Latos, while going from projected last-place finish to nearly reaching the playoffs, if not for a late-season collapse (a la the New York Mets) that opened the door to the World Champion San Francisco Giants to get their crack at the postseason. and a rather scary few years that will likely end with a decent team in around 2014, just when Latos is going to command a payday San Diego won’t pay, leading the loss of that ace. This could become an ugly cycle of rebuilds if the team won’t ever move the payroll into the $60 million+ range. There is hope, though, even if it isn’t a lot. Latos, as stated before, is a stud. He could be what San Diego wanted out of Chris Young and more–maybe even their next Jake Peavy. Kyle Blanks was terrible this year, but he also did not have a lot of time to play, and his bat might be able to take over for Gonzalez in the long-term. 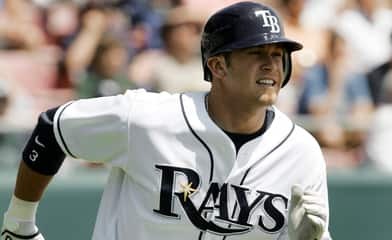 Everth Cabrera showed some skills on the basepaths in 2009, and Donavan Tate is a promising hitting prospect in the outfield. 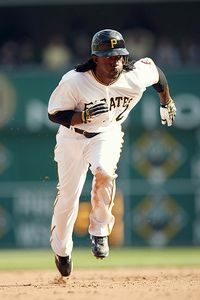 Pittsburgh Pirates (Record: 57-105; Attendance: 19,918;RSN Rating: 3.44): Here is a franchise that is hard to like at all. I cannot recall their last REALLY GOOD pitcher that actually stuck around (really, any guesses?). Jason Bay and Nate McLouth had talent, but they were sent away and have brought little back thus far (though we should hear from Gorkys Hernandez before all is said and done). The team hasn’t had a winning season in 18 years, and it is staring at yet another top pick–the first overall, in fact. The TV ratings are actually rather solid at 16th in the league, but that’s where that ends. Pittsburgh was 29th in payroll in 2009, with a pitiful team salary just shy for $9 million. In 2010, they actually cut it to 30th in the league, spending just under $35 million on the MLB roster. Some of that went to scouting, but in a rather large market, this is still inexcusable. The Pirates were 27th in per-game attendance at PNC Park, and 25th in attendance percentage. The Pirates are the pinnacle of mediocrity. Even with young talent in Tony Sanchez, Pedro Alvarez, and the dynamic Andrew McCutchen, I don’t see any way this team avoids the big 2-0 in terms of consecutive losing seasons. Honestly, I wouldn’t be all that shocked if they broke 25 with the pitiful rotation they are marching out. They had plenty of opportunity to sell high on both Zach Duke and Paul Maholm, but now they are stuck with two mediocre lefties headlining a starting five that looks even worse as a whole. With the Marlins, the story is rather different. is why I want this team gone. Rather recently, it was reported that the ownership of the Marlins lied about its financial status to get more money from the state to fund its new home. Of the $634 million to be spend on the ballpark, Florida’s ownership group (led by Jeffrey Loria) will pay just $155 million. That leaves the taxpayers to foot a bill of $479 million for the stadium, or over 75% of the price tag. According to Yahoo, the taxpayers will be paying for this for a LONG time. The loans won’t be paid off in full until 2049, and the interest will end up adding to a loan total of $2.4 BILLION! Now, is it really fair to tell the sub-20,00/game Marlins fans that they are losing their new stadium and baseball franchise because of the lying and cheating of its owners? No. But is it fair for the entire state to pay over $2 billion to build a ballpark most of them might never even go to? No. And, when it comes down to it, a state’s economic health is more important than baseball. Ideally, the government or SOMEONE stops this, but the only sure-fire way to fix the matter at this time is to kill it at the roots. If there is no baseball team to provide for, then there is no egregious payments that will kill the Florida economy for decades. So, the Pirates and Marlins are gone. Where does that leave baseball in terms of divisions? Well, we are sitting at fourteen teams per league, so nothing will be 100% even. We will try our best to get it close, though, meaning each league will carry two 5-team divisions on one four-team one. For the AL, everything can essentially be left alone. In terms of ideal fairness, you would pull the Rays out of the East. You could move the Royals to the West and the Rays to the Central, leaving the East with the Yankees, Red Sox, Blue Jays, and Orioles. This would allow all 3 teams–the Yankees, Rays, and Red Sox–a chance to get into the postseason, which I think any pure baseball fan would enjoy. I think that is the best option to keep the Boston-New York rivalry intact while keeping competitive integrity intact. The National League will require no other adjustments. The revamped NL East would open with the Phillies, Braves, Mets, and Nationals. The Central has the Reds, Cardinals, Cubs, Brewers, and Astros. The West rounds it out with the Giants, Padres, Rockies, Dodgers, and Diamondbacks. As I said at the beginning of this article, contraction is highly unlikely in the league. Losing revenue is never a business’s first choice. These choices are about more than just. Cutting these teams helps both to balance the leagues and to stabilize the long-term Florida economy. There are better, more complicated option that could be explored, and I might ramble on about them in the future, but this appears to be the most simple, immediate solution to the nation’s financial woes and the complaints from fans that the leagues lack balance.